When I was a child, one of the highlights of the beach was heading down to the boardwalk at nearby Rehobeth Beach. 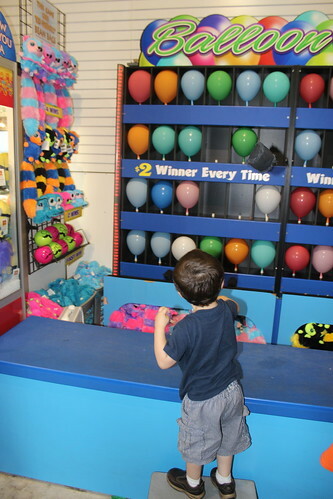 My favorite thing was the “Horsey Game” at Funland (I believe the game is officially called “Derby”) Contenders roll balls (sort of like skeeball without the ball going airborne). The hole your ball goes down determines how many steps your plastic race horse takes. The first person’s horse to make it to the end wins a prize. My mother spent some quality time with Dyson, while I had some rare Mommy-Sagan time. I was determined Mommy-Sagan time was going to involve a prize, by golly. Not just any prize, a Horsey Game prize. En route to the Horsey Game, we stopped and played Wak-A-Mole. We won a cute white stuffed dog. Onward to the Horsey Game. It was $1 a game. I was going to spend up to $20 dollars, maybe even more, playing that game to win a prize. Luckily, it only took four games. Sagan sat on my lap the entire time and at times opted to roll the ball. It was fun to share that with him. 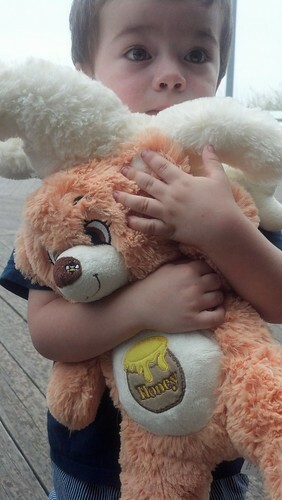 When we did win, he got to pick between two different bears. 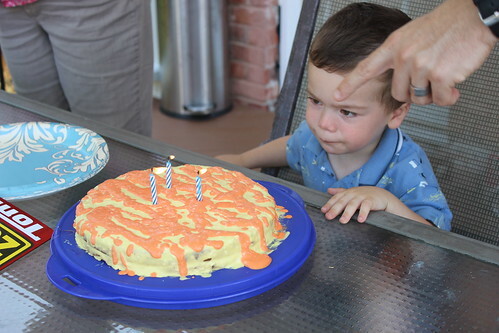 Win prizes for my son? Check. I met my day’s goal. Everything else was going to be bonus. I wouldn’t want to ride those rides, but I also didn’t want to disobey my father, so I would reluctantly do my duty as the big sister. Some of that same ancient dread snuck back in when Sagan asked for rides. It took me a moment, but then I realized, “Wait a second. He’s a little kid. 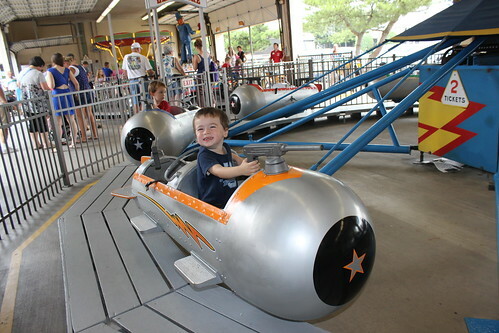 I can handle little kid rides.” : ) And it turned out Sagan didn’t need *me*. 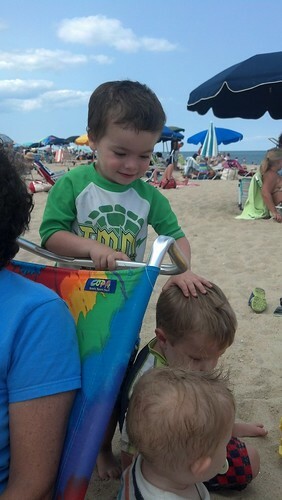 He was perfectly happy going on rides with his beach buddy, Mya. 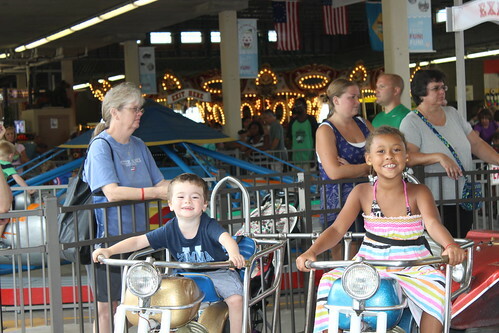 Funland is VERY young-child friendly. 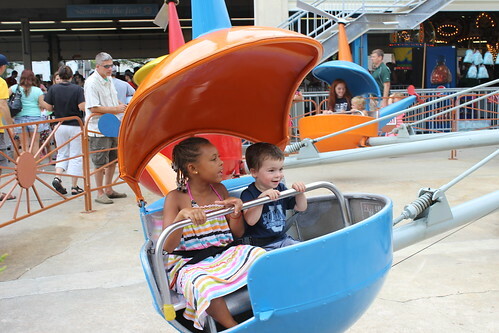 They have a whole section of rides dedicated to the smaller children where the young kids can even go by themselves without an adult or older child. In addition, they have games where the child gets to play until he/she finally wins. This came in handy with the balloon pop game for Sagan. Funland did an excellent job of tiring both boys out. When we got back to the beach house, they both napped at the same time… AGAIN. Ah, I love vacation. While they napped, I packed. My mother and I had decided it would be best to travel at night while the children slept. We had one final supper with my extended family– a delicious array of pasta. After supper was over, we hit the road. So the day before at Sea Colony, I was looking over some of their literature and I squealed with delight to see that they had a BodyPump class. Not only that, there was a BodyPump class the very next day!!! At home, BodyPump is one of my favorite parts of the week. How amazing that I can attend a class at the beach! My Uncle generously allowed me to borrow his passes so I could attend the class. I love BodyPump so much, I talked it up, as one is very apt to do when something super fun like BodyPump is concerned, and my cousin Jennifer decided to join me. Knowing how much I love BodyPump, my mother agreed to watch the boys and away we went to Sea Colony to pick up fitness passes and attend the class. My great Aunt Maisie is a woman in her eighties, but she carries with a childlike curiosity and enthusiasm for the world. She sees everything with an innocence you would expect to find in someone decades younger. Earlier in the week the topic of Seltzer Water came up. Great Aunt Maisie told a simple story about a time she was in the airport and got a soda. She thought it was Gingerale, but it was actually Seltzer Water. With wide eyes and that innocent, pure voice of hers, she talked about that first unexpected sip. When you are expecting something sweet like Gingerale, and you get Seltzer Water, it’s quite a shock. It doesn’t mean Seltzer Water is bad, mind you (I’m a fan). It just means you were expecting something different. And it tastes worst than it is just because of your expectations. Back to our BodyPump adventure, I had noticed that BodyPump class at the beach was only 45 minutes long, but I didn’t think much of it. I also failed to notice that the schedule read “Body Pump” instead of “BodyPump” and that at no point was Les Mill’s branding touted. We showed up and paid our seven dollars and I promptly noticed there were no bars. “Huh. I guess we just use free weights here,” I thought, still oblivious that the Gingerale I was about to drink was, in fact, Seltzer water. Then the warm-up began. There were no squats. We weren’t doing it in time to the music. Wha– you want me to kick my feet out? All the signs were there all along, but it took me until then to realize I wasn’t at Les Mills BodyPump. But then here’s the thing. Exercise (at least for me) makes everything better. As my body started moving and my muscles started working, my mood improved. It wasn’t Les Mills’ BodyPump, but it was fun and it was a solid workout. My abs were sore the next day. And my cousin had fun too. I solicited another compliment from a different Aunt about my kids’ eating habits. My Aunt Julie marveled at Sagan eating an avocado and concluded, “You’re so healthy!” Score! Once he saw me, he wanted his shoes, but he didn’t want to go back to the beach to get him, so he sat on a bench with my cousin Jennifer while I fetched his footwear. When I came back to the bench, I could hear them talking. Dyson stayed on the beach with my mother while I took Sagan back to the beach house. 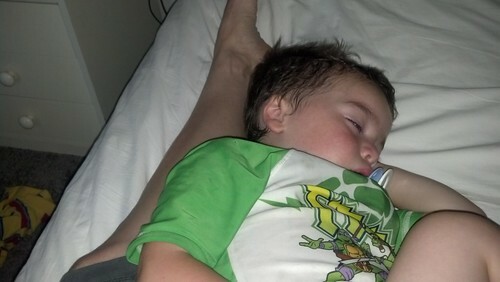 I bathed Sagan and he went down for a nap. By the time Sagan was sleeping, Dyson and my Mom came home, so then I bathed Dyson and he went down for a nap, while Sagan was still napping. Double Nap AGAIN. BOOYAH! Fun fact– did you know you can’t do Lasik eye surgery when you are breastfeeding? The breastfeeding hormones can have an effect on your eyes, so they prefer to wait to map your eyes until at least six weeks after weaning. I found that out with my first child, so my game plan has been after Dyson is weaned perhaps getting that Lasik surgery. Family dinner is making me reconsider that notion. 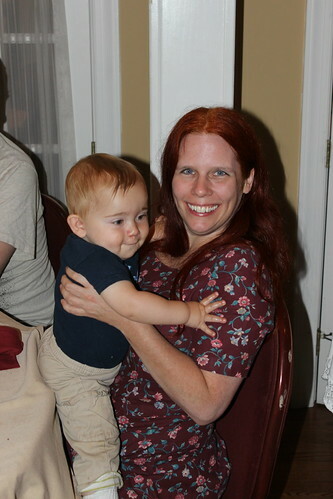 I wore contacts to the family dinner and apparently I looked especially tired and frazzled. A few people mentioned it. I hypothesize when one has glasses on, it better camouflages fatigue. I was tired, but I’m always tired (I still night nurse). I didn’t feel any more or less tired than your usual day. Mitigating the two kids was hectic with the particular challenge of our entrees arriving well after our usual bedtime. I certainly didn’t have a lot of ample time to socialize or take pictures, but I didn’t feel overwhelmed (that would come the next day) and I had plenty of friendly faces and helping hands around. Even my child-free-by-choice sister pitched in! At the end of the night, though, as I loaded two tired and cranky kids into the carseats, one of my aunts told me she felt sorry for me. And dude— we got home again well before everyone else. AGAIN– a most pleasant night night. Both kids went to sleep right away! My Uncle Mark and Aunt Denise were staying at a Condo at Sea Colony. 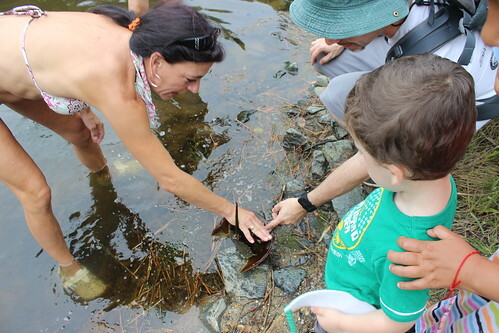 On Wednesday, July 30th they invited us to spend the morning with them at the pool and other Sea Colony facilities. My cousin’s daughter, Mya, joined us. Sea Colony’s great and I am seriously considering staying there in future years. 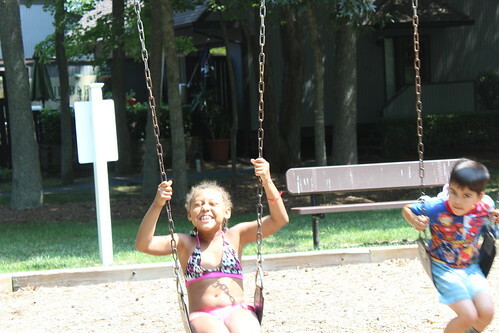 They have pools, walking trails, tennis courts, playgrounds, and a fitness center. I really enjoyed my time there. 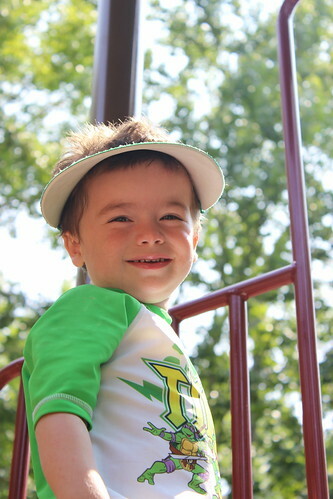 Sagan was a little weary about the pool, but we did get some smiles out of him. 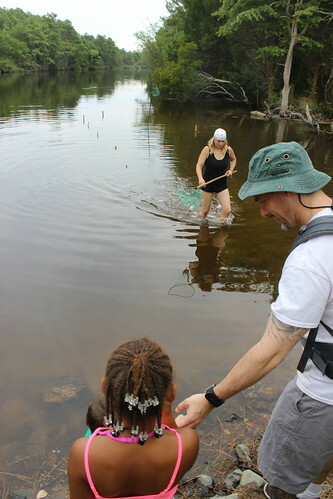 He also obliged me while I carried him around the “big pool” for a while and showed him the filters that picked up all the trash and bugs in the water. Ultimately though, Sagan preferred to be on land. Mya asked him to give her a massage and to my surprise, Sagan started kneading her shoulders. Where did he learn to do that? What the—where did he learn that? Dyson is fearless and enjoyed the kiddie pool. 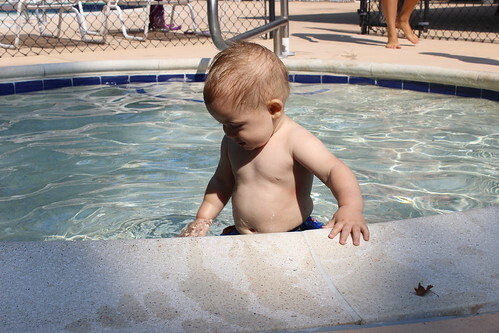 He liked feeling empowered and climbing in and out of the pool himself. 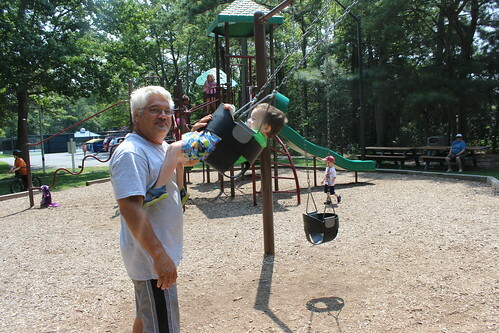 Once everyone was tired of the pool, we decided to hit one of the nearby playgrounds which was a big hit. And after the playground, it was lunch time. We headed back to Uncle Mark and Aunt Denise’s condo for PIZZA!!!! Everyone loved that. Chinese Food and a Great Compliment! We were so close to having pizza TWICE in one day, a notion I have to confess I was somewhat excited about (Hey, I’m on vacation!). It was pointed out that we had pizza for lunch so we got Chinese Food instead. It wasn’t pizza, but hey, it’s a good option as well. Sagan, Dyson, and I ate outside on the deck. I like eating outside and without dogs to clean up the aftermath (think rice strewn EVERYWHERE), strategically it makes better sense. Sagan amused me by asking for tofu. When we get Chinese Food at home, I get a Tofu General Tso’s which Sagan typically eats half of. Luckily, he’s a big fan of chicken as well. I alternated handing my two boys pieces of broccoli, peas, rice, and chicken. Everything was delicious, so the kids were devouring away. And then I got the BEST compliment. That totally made my day… as vegetables are near and dear to my heart. I did have to confess, however, that there are days where Sagan will only eat chicken nuggets and fries. We have good days and bad days. I LOVE that Denise happened to be sitting next to us on a good day. The compliment STILL makes me happy. I discovered walking for Frozen Custard after dinner was significantly easier when Ryan was around. It was tricky keeping Sagan situated with his napkin demands (he hates when things spill on him, even if it is delicious melted ice cream) and trying not to drop Dyson whose center of gravity was making dramatic shifts as he kept trying to dive-bomb my chest. Stress level, I think it was probably the second most flustering moment at the beach, but it all worked out. We took early leave from Dickey’s which put us back at the beach house before everyone else. And SHEBAM! Another easy and pleasant night night time. The kids went right to sleep AGAIN! Our beach sleep schedule RULED! 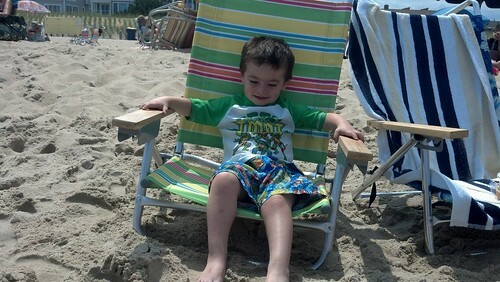 Tuesday, July 29th was Ryan’s last day at the beach as he had to return to work. 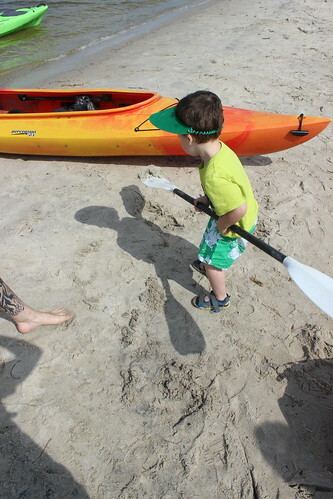 The ONLY thing on his request list for the beach was to kayak with Sagan. 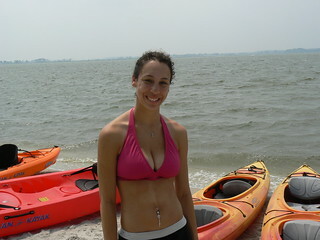 First thing in the morning, we went back out to Coastal Kayak. This time the conditions were much better. We also had company! 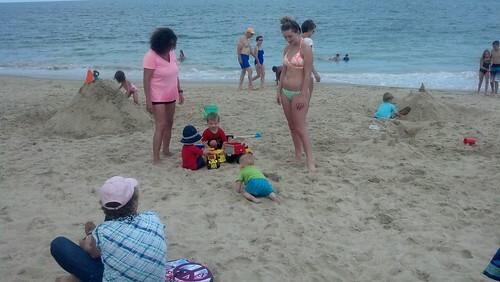 My Aunt Denise and Sagan’s Best-Beach-Bud Mya joined us. Family Kayaking- Now with 50% More Family! 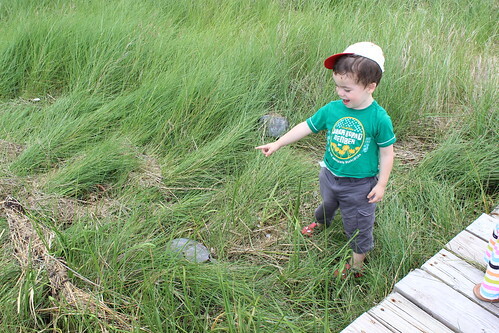 We saw an osprey’s nest and mussels growing in some of the tidal grass. Sagan was all smiles. He really enjoyed the kayaking. And here’s something neat. 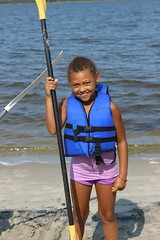 Back in 2007, when Mya was just a little baby, I went kayaking with her mother at the exact same place. 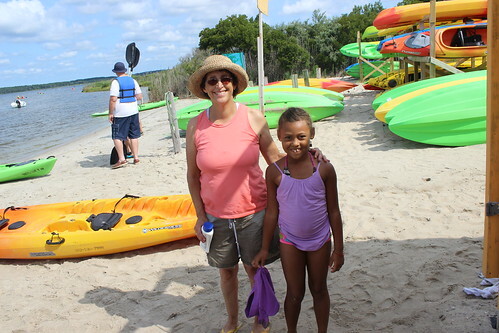 So now I have kayaked with both mother and daughter. For lunch, we took the kids to Mickey’s Family Crab House. Dude. That was fun and delicious. We ordered clam strips, steamed shrimp, steamed Maryland Blue Crabs and grilled asparagus. This was a GREAT destination for young children. It’s socially acceptable to make a lot of noise. It’s socially acceptable to make a gigantic mess. And the meal comes with its own entertainment– mallets! Both kids really, really enjoyed hammering. 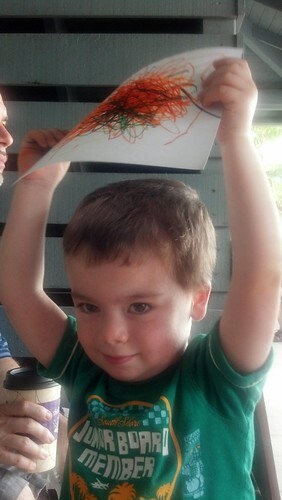 We had such a great time picking apart and devouring crabs, Ryan declared this is what he wants to do for his birthday. Done and done. After lunch, we did some more biking. 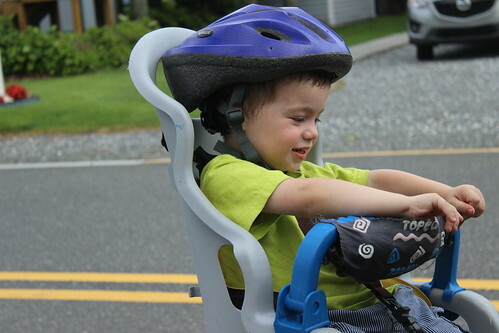 Little Dyson would not keep the bike helmet on (It was ill-fitting anyway), so he just got a quick bike debut up and down the street. Just long enough for us to say he went bike riding. After that, Ryan and Sagan took the bike out for a couple of hours. 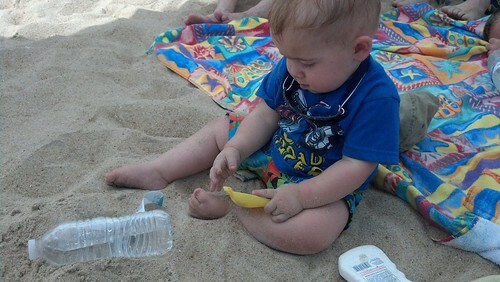 While Ryan and Sagan were out and about, I took Dyson back down to the beach. He was in a much better disposition today. He was so courageous, in fact, when he saw some cousins he wanted to play with, he just crawled across the sand to get to them. We packed five binkies for the trip and only came home with three. One I have no idea where it went. 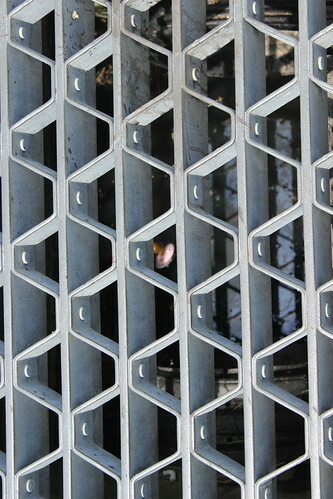 And one…well, it fell down a storm drain. Remember yesterday when I talked about adventures coming in smaller packages with kids? Well, on the flip side, you get to see things through your children’s eyes and small things, even mundane things, become exciting and fresh again. 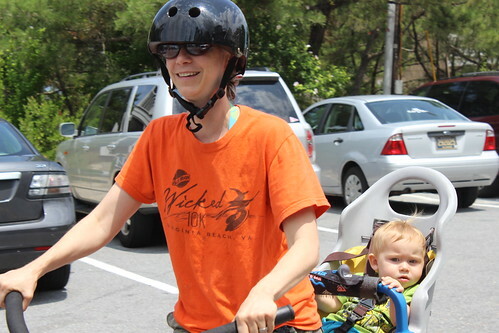 With kids, anything can be an adventure…even going to the grocery store. Before Ryan got back on the road to head home (Sadness), we went for a family shopping trip to pick up some provisions. We put the two boys in a specialty shopping cart shaped like a truck where both boys could have their own steering wheel. Sagan and Dyson LOVED it. 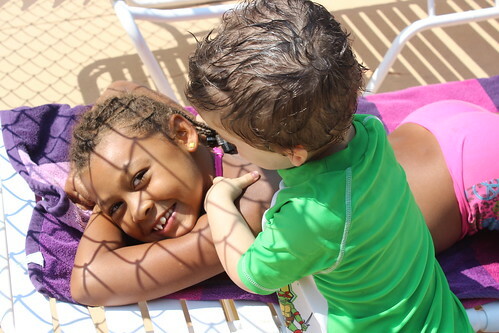 They spent the entire trip wrestling and laughing and tickling. It was probably the most concentrated amount of fun they had the entire trip and it was just a joy to watch. When we arrived at the beach the previous Saturday, I mysteriously lost my voice. By the end of Tuesday, I had some congestion. I thought it was pretty safe to take some Benadryl, but boy, the drowsiness was really getting to me. So I left the children on the beach house deck with my mother to take a nap. Before I could fully drift off the sleep, I heard Sagan in the living room. I went out there to see what was going on and found him laying on the floor with a beach towel over him like a blankie trying to take his own nap. Well, who could turn that down? We returned to the bedroom and we both fell in such an extended sleep, my mother had to wake us both up for supper. A still-sleepy Vicky and Sagan meandered their way over to Aunt Julie’s Beach House where we were having Family Taco Night (one of my favorites). The food and company energized both of us. I was somewhat worried about the notion of putting both kids to sleep by myself in such an exciting environment, but “night night” could not have gone smoother. 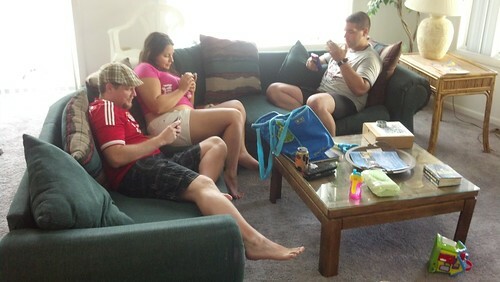 The kids and I got back to the beach house before everyone else. In the dimly-lit bedroom, I changed diapies, put on jammies, and other night-time tasks. Both Dyson and Sagan went to sleep right away and I wasn’t too far behind them. Our second full day, we paid homage to my late father and walked down to The Frog House and had breakfast. We made another quick stop at Comics and Games and then we went to the beach! We like to consider us an adventurous family. We hike and kayak and camp and canoe and bike. But our kids are significantly less adventurous when it comes to the ocean. Sagan is more vocal with his fear. 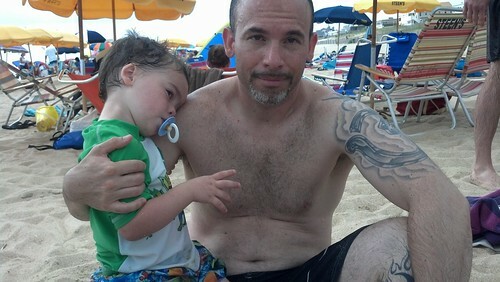 Ryan did get him a little more comfortable with being in the ocean… that is until a wave splashed him in the face. Dyson, on the other hand, liked looking at the ocean, but would whimper when a big wave touched my feet (It wasn’t even touching him!). Dyson did enjoy playing in the sand. 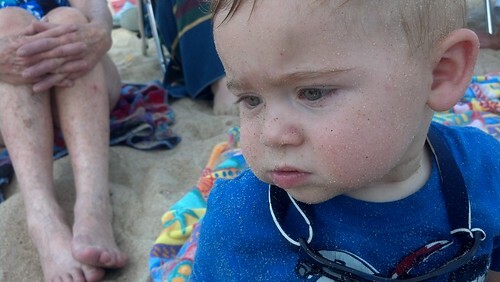 Sagan, however, was so miserable from the whole “water in the face” incident that not even the binky, or the arrival of Uncle Jay could convince him to enjoy the beach. And I learned a very good lesson that day. 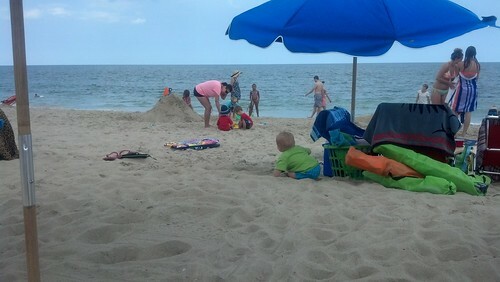 Don’t wait until the baby is exhausted and tired to leave the beach. Why? Because you still have to walk back to the beach house. You still have to contend with all that sand. You still have to get him in a dry diaper and clothes. This produced a lot of crying from an already over-fatiqued baby. Lesson learned. I would not make the same mistake in the coming days. And then another obstacle to adventure. Dyson napped…. and then when he woke up, Sagan went down for a nap. Gah! This was somewhat disappointing to Ryan. He only had a limited time at the beach and he wanted to get out and do things, not wait for the children to sleep. One of my fond memories of the beach as a child was husking corn with my cousins and squealing should we peel away the green and find a worm underneath. I mentioned yesterday I had hoped a new generation of cousins could have the same experience. It didn’t quite work out, but Sagan, Mom, Ryan and I had fun enough husking corn and snapping beans. Dyson didn’t exactly help, but he had a great time moving beans back and forth between the bag and the colander. 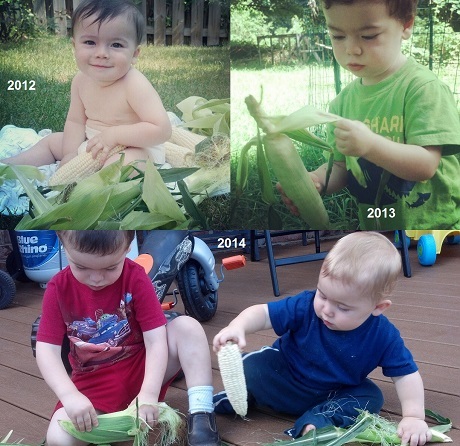 I didn’t take any pictures of the husking that day, but corn husking is something I enjoy, so I happen to have pictures of family husking from 2012 (when Sagan was 1), 2013, and 2014. 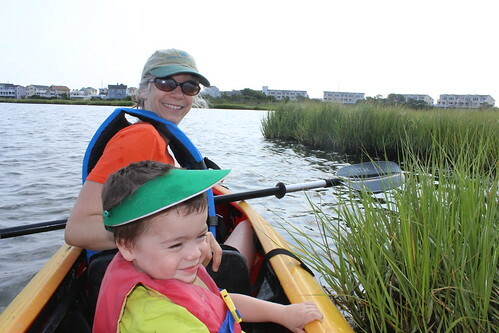 When Sagan woke up, we left Dyson with my mother and headed down to one of my favorite places– Coastal Kayak! 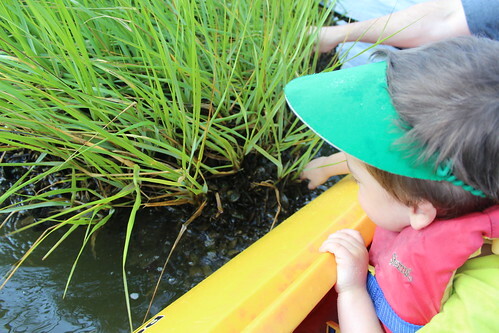 In the past few months, Sagan has gone canoeing and rowboating and he loved both. 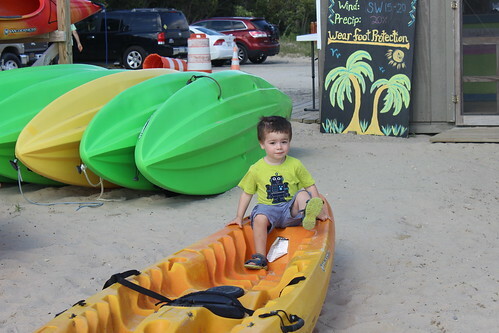 We wanted to add kayaking to his resume and kayaking was the only thing on Ryan’s list when you asked him what he wanted to do at the beach. Unfortunately, as soon as we arrived, the flapping windsocks and the ample whitecaps in the usually calm Assawoman Bay made it clear it wasn’t going to happen. The Coastal Kayak staff was kind and upfront. 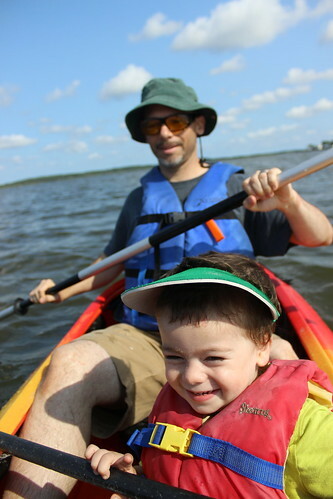 They didn’t think it was going to be a great day for Sagan’s kayaking debut. Defeated, defeated, defeated, Ryan and I started back to the beach house. The vibe in the car wasn’t a particularly happy one. This day was definitely not going as planned. “No, we used to be adventurous,” Ryan mumbled. And then, a brainstorm. Biking! We got down to the Bethany Bike Shop right at closing. We had just enough time to rent their last beach cruiser with an attached car seat for 24 hours. 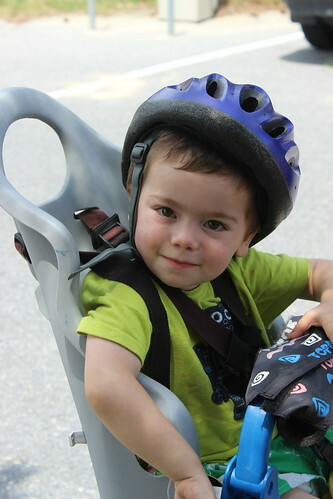 Ryan loaded up Sagan and went for a long ride back down to the Delaware Seashore Fresh Pond park we hiked the day before. He had a phenomenal time and found better trailhead parking for the park. While Ryan and Sagan biked, I wrapped up little Dyson in the MobyWrap and we went for a two mile walk in the wet sand of the shoreline. Oh my goodness. I thoroughly, thoroughly enjoyed that walk. The sea breeze on my face, the salt air in my nose, the purring of the ocean and laughter of children in my ears. Everything about that walk was just perfect. Unlike the morning, Dyson was unconcerned with the waves, he rested his head on me and just watched as they rolled in and out, in and out. Soon he was asleep. His left ear was against my chest, listening to my heartbeat. The right, the ocean. How peaceful that must of have been. While he slept, I loved watching the teenagers surf their wakeboards from the shore *into* the incoming breakers. The forces propelled them up into flips in the air. 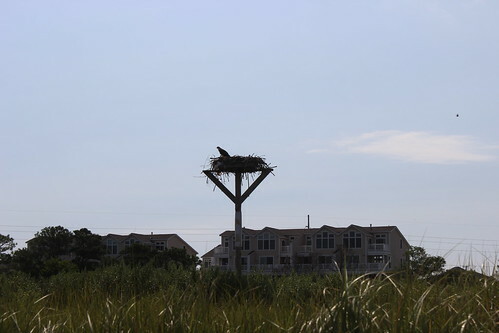 And then my favorite part– I saw not one, but two, ospreys dive into the ocean and catch a fish…on the very first try. For some reason, I thought they would have to make a lot of attempts to catch a fish. They made catching fish look easy, though they did make flying around with a fish look a little awkward. I didn’t have my camera, but this wonderful Creative Commons photo by Andy Morffew is a good illustration of what I saw. Dyson and I returned home right as Sagan and Ryan finished their bike ride. Together, we all walked over to my Aunt Julie’s for supper. My Aunt Denise made a delicious pork roast with fresh rosemary. We also had the freshly husked Farmer’s Market corn which solicited a lot of compliments. But what took the cake– my Uncle Timothy took those Farmer’s Market green beans, microwaved then for 4 measley minutes, and added the Farmer’s Market mushrooms, which he sautéed in white wine and butter (I believe this recipe was his inspiration). It was delicious. I normally try to do everything I can to encourage my children to eat vegetables. But that dish was so delicious, I actually stole some from Sagan’s plate when he wasn’t looking. 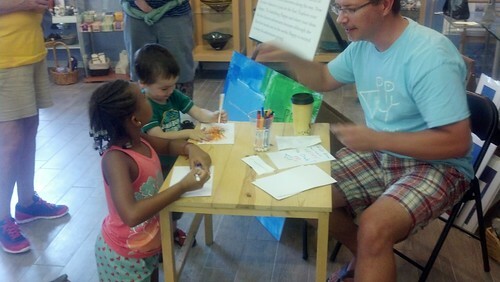 Although the day had a series of fails and frustrations, we ended up with an ample supply of happy memories. As parents, adventures come in smaller packages and sometimes that is a mental adjustment for Ryan and I. Compared to our previous selves, it feels like we aren’t get anything done. But you compromise, you regroup, you do what you can, and little by little you end up with a full experience. 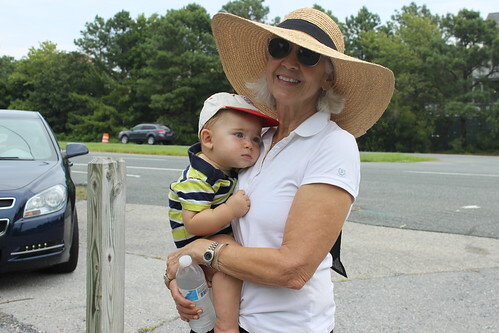 Our first afternoon at Bethany Beach, we were in the market for a Family Hike. I pulled up Google Maps on my phone and scanned for green patches near us. 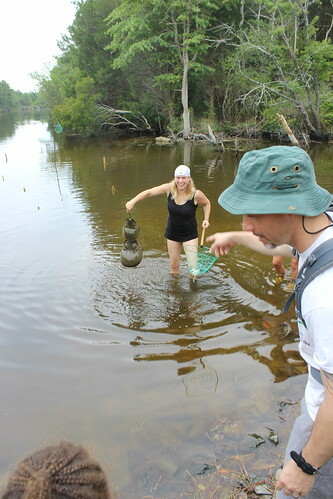 That’s how I found a section of Delaware Seashore State Park called “Fresh Pond”. I’ve been coming to Bethany Beach ever since I was a little girl, but I was never aware of this park 2.1 miles away from our beach house! It turns out there were other relatives interested in hiking. 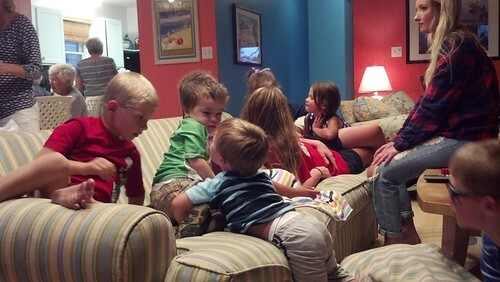 We ended up with Ryan, Vicky, Sagan, Dyson, Mom, my Aunt Priscilla, my Aunt Denise and my first cousin once removed, Mya. It was a Family Hike…with 100% more family!!! 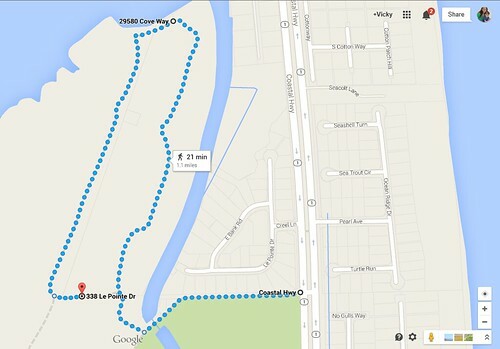 After serving us extraordinary well the past two days, Google Maps had a little bobble. 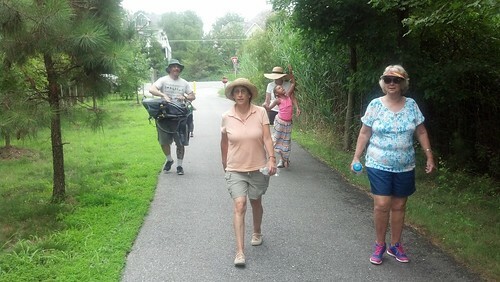 It directed us to a residential neighborhood with less than optimal park access– it required bush-wacking. Instead, we parked at a trailhead on the northeast corner of the park off Coastal Highway 1, about a half mile north of Silver Sands Drive. We took a 0.2 mile connector trail and turned right on the Prickley Pear Trail. In about a 0.5 miles, the trail took us to a gorgeous view of Beach Cove and arguably less than gorgeous views of horseshoe crab corpses in various stages of decomposition. : ) We continued along the Prickley Pear trail and formed a loop back to the connector trail. I believe we went roughly 1.4 to 1.6 miles total. 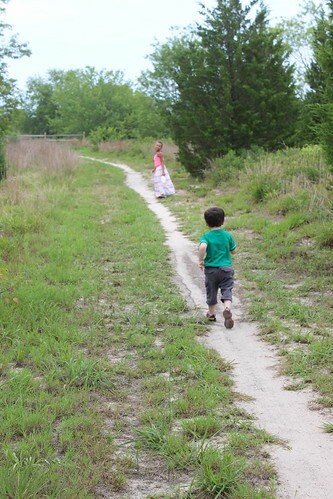 The trails were flat and well-worn, perfect for the children. The best part about this trail was I got to learn a new plant. 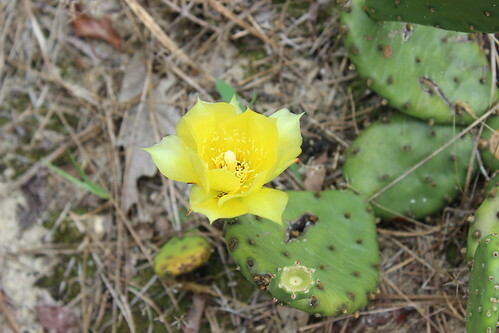 I have been on other trails called “Prickley Pear” before, but it never occurred to me to find out what a Prickley Pear looks like. My Aunt Priscilla, a resident of Arizona, was quite familiar with Prickley Pears. She recognized the cactus immediately. They were plentiful along the trail and we even saw one blooming. 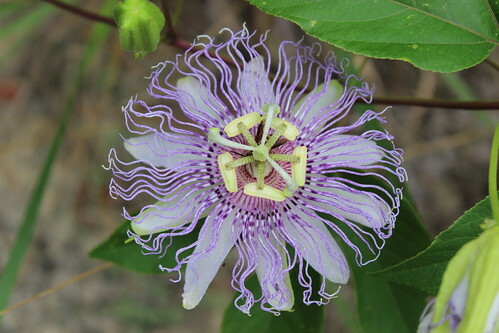 Another lovely find was Passiflora incarnata (Purple Passionflower). They are so intricate and lovely. Although short, it was a great family hike with plenty to see. We all had a great time visiting with each other, particularly little Sagan and Mya. More pictures of Delaware Seashore – Fresh Pond can be found on my Flickr site. 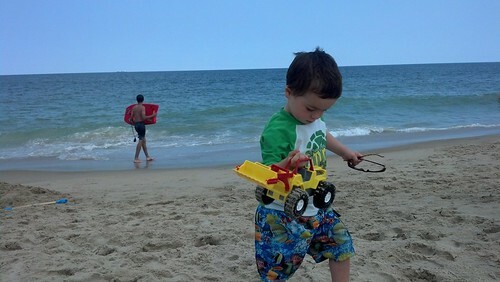 Sunday July 27th was our first full day at Bethany Beach and we made the most of it! When I woke up, I wasn’t particularly in the mood for a morning run. I actually prefer to run in the evenings and only do morning runs when I’m preparing for a race that’s in the morning. But I knew from experience, we have late dinners at the beach as some of my relatives are from the west coast. I also knew Ryan was only going to be around two more days, so if I wanted to run, I needed to get it done while he was in town. So I forced myself to run. I’m glad I did. It was delightfully drizzly out and I was invigorated by the salt air. The coffee pot in our beach house had an untimely altercation with gravity, so it was the perfect excuse for a coffee snob like me to go to The Artful Bean. Ryan, Mom, Sagan, Dyson, and I walked over and ordered some fancy coffees and some breakfast sandwiches. While we waited, my Aunt Priscilla and my cousin’s daughter, Mya, showed up. After the coffee shop, we were just a couple of blocks away from the Bethany Beach Farmer’s Market, so we decided to head that way. Each week, Ryan and I do a Family Walk with the kids to our local farmer’s market. It was nice to keep up our tradition depsite being at the beach. When I was planning my wedding, my boss and friend, Larry, told me, “You are such a cheapskate except when it comes to food.” He was referring to restaurants, but his observation is just as apt for produce. Ryan and I can tear through some cash when it comes to Farmer’s Markets. And so, I spent 33% of my on-hand cash the very first morning at the Bethany Beach Farmer’s Market. Some produce, I got with the children in mind. My boys like husking corn and snapping green beans, so we got 26 ears of corn and a huge back of green and yellow beans. I had visions of a whole group of cousins sitting out together husking corns and snapping beans, like I did as a child. It didn’t quite turn out that way, but that’s okay. Lately, we have been on a roasted okra kick, so I got some okra (which turned out to be a delight to my Great Aunt Maisie). Peaches, raspberries, etc. THEN– something I’m so envious of. The Bethany Beach Farmer’s Market has MUSHROOMS! I’m a huge mushroom fan, so we bought a variety of mushrooms for the beach house from Davidson Exotic Mushrooms. LOVE! Our final stop in our morning walk was the Comics and Gaming store. My husband is a comic book shop enthusiast with aspirations of running his own shop one day. It’s a great little shop with a wonderful assortment of inventory. And a nice little coincidence– it turns out it is owned by the son of one of my father’s friends! 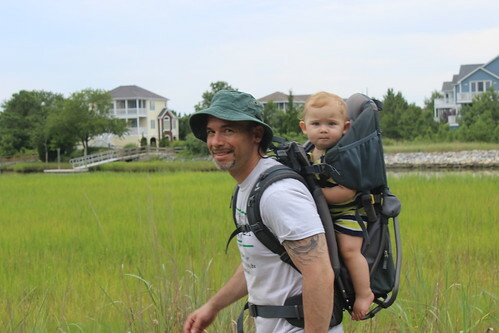 So when my mother and I were packing, the car was pretty tight and Mom observed, “Everything in Bethany is really close.” She was right and Ryan and I often carry the kids long distances on hikes, so I decided not to pack the double stroller. That first outing on the first day illustrated conclusively to Ryan, Mom, and I that whoopsie, yeah, we really do want the double stroller. This was going to be more vital later in the week when Ryan was back at work and it was just Mom and I (Mom is not big on carrying children like Ryan is). Luckily, my brother and his fiance had not arrived yet. My mother called them and they agreed to swing by our house and bring the double stoller with them. That turned out of be key to the rest of the trip. 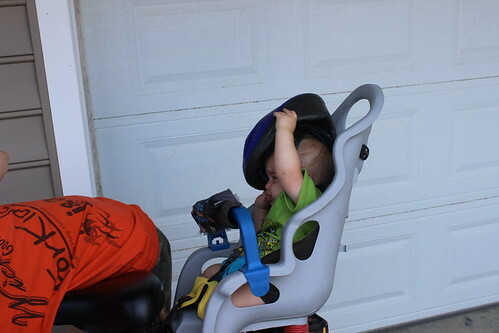 Lesson learned– make room for the double stroller. With our shopping excursion done, we were in the market for something to do. A good time for a Family Hike at Fresh Pond! After that, our day’s progress took a screeching halt as the kids needed to nap. For supper, we walked over to my Aunt Julie’s beach house where her family made a giant feast of delicious spaghetti. We would find that dinners would become one of Sagan and Dyson’s favorite part of the day. 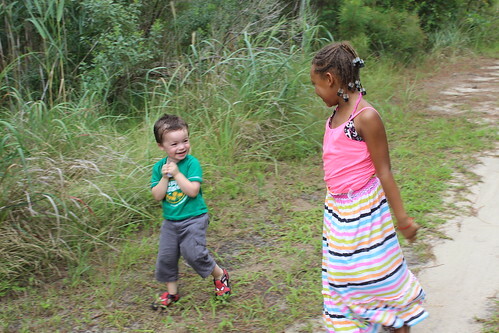 They both very much enjoyed playing and chasing the amply supply of cousins there.